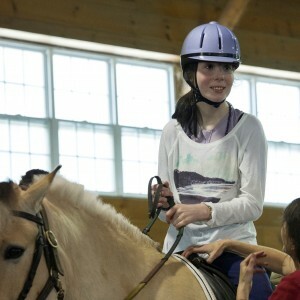 Lovelane is a therapeutic horseback riding program that has a dramatic impact on the social, cognitive and physical development of children with an array of special needs. Therapeutic horseback riding focuses on achieving wide-ranging therapeutic goals in a unique and motivating setting. The benefits from therapeutic horseback riding, especially for children with special needs, are derived from using the movement of the horse to work the muscles of the rider to achieve therapeutic goals. The three-dimensional, rhythmical motion of the horse’s movement stimulates and works the muscles of the rider. And because the horse’s gait is almost identical to the human gait, the motion of the horse simulates the normal sensory-motor input of walking. Core to Lovelane’s mission is to treat each individual child as therapeutically as we can and to integrate what we do to address and enhance all areas of their lives. We do this through our personalized sessions, our long‐term commitment to their growth, our constant communication with their families and through our intimate experience with their ever‐changing needs and development. For more information please contact Cassie Clarke at Cassie@lovelane.org 781-259-1177 x34.